Proudly created in 2009 in Quebec and Mauritania, the La Khaïma Foundation is committed to the development of nomadic communities in Mauritania. What if you could participate in one of the biggest projects of your life? Acacia Road is the name of a future green highway in Mauritania. It aims to be both ecologically sustainable and economically feasible. It does not call for tar or expensive and polluting machinery. The idea is to replace bitumen with roots covered in clay and other locally sourced and available material. This road will be sustainable thanks to reforestation, through a traditional technique for dune fixation. Connecting Ividjaren to the Route de l’Espoir (the Highway of Hope), which is the national highway that passes within 5 km of Ividjaren. This secondary road will be lined with trees and will improve access and increase mobility, which will lead to endless possibilities. Acacia Road aims to be the cornerstone of economic, social, and environmental development in the region. Its goal is to tackle several major, closely interconnected issues: desertification, climate change, and biodiversity loss. The project envisages a completely collaborative and inclusive approach, integrated with the local communities and other actors on the ground. What a story! Since 2014, we’ve been sending money to the semi-nomadic inhabitants of the Ividjaren region in Mauritania. Nothing original? Yes! The impact of a social economy is enormous. It’s not simply about giving money, but about influencing the local economy. Our goal is nothing short of reducing inflation around the village of Ividjaren! How? The Foundation makes useful purchases for the inhabitants. What’s important is that these purchases be made in bulk, which helps reduce prices. All too often, the nomads are forced to sell their animals, which is a major economic and symbolic loss. What we’re trying to achieve is to allow access to basic foodstuffs without the inhabitants having to pay too heavy a price for it. The Foundation certainly does not make a profit on these operations. Afterwards, it withdraws from the market, but it never does so completely. It’s present, like a watchman. And it repeats this operation each time that it becomes necessary. Our goal is to slowly lessen this dependency by working on these various projects that empower locals to create sustainable economies, whereby the Foundation is no longer needed. Additionally, with the arrival of new mining companies in different regions in the country, one has to provide better information on the existence and the needs of the nomads of Mauritania. We would like the mining companies, operating in Mauritania, to better integrate these people in their development programs, to do so in a sustainable manner, and to find concrete ideas to better serve this population in order to combat marginalization. In 2014, during the Mauritanides, a conference on the mining and oil sectors of Mauritania, Atigh, the president of the Foundation, gave a seminar to the insurers of oil companies. Nothing can be done without first taking the time to listen. Since its inception in 2009, the La Khaïma Foundation has been consulting with the nomads of Mauritania to better understand their needs. Nothing can be done without including ancestral knowledge, whether one is dealing with ecotourism, sustainable development, tree planting, the installation of solar-powered water pumps, development of market gardening and orchards, the use of solar energy for lighting and food production, or combating desertification. In 2014, a set of sustainable development initiatives were launched in partnership with the agropastoral cooperative of Ividjaren, such as refurbishing an old well and installing low-cost solar panels in several villages. It was a success! Since these initiatives, the agropastoral size has doubled in the small village of Ividjaren, located 5 km from the Route de l’Espoir (Highway of Hope), the main highway of Mauritania. Volunteers from the La Khaïma Foundation facilitated a meeting with dozens of neighbours and other citizens, including researchers, engineers and anthropologists, in order to find solutions specifically adapted to the area. The foundation helped fund the creation of a seed bank. The particular seeds in the bank are adapted to a desert environment. They are gathered and cared for by women who use nets to protect their saplings. At the same time, a new pump was installed to increase the amount of water taken from the aquifer helping in both reducing labour output and increasing production. Presently, the community of Ividjaren faces acute dry spells made more severe due to climate change. Faced with record high temperatures, we are looking for new solutions. In 2013, a drip irrigation system was installed to allow for a new garden to be setup. In 2013, we were able to meet with officials working in related domains. We articulated the needs of the nomad peoples to the head of the European Union delegation in Mauritania, the ambassador of Germany to Mauritania, and the resident director of GIZ (a German development agency) in Mauritania. We see that the nomadic peoples are often left out of aid and development discussions so this was a chance to bring awareness to the nomad peoples’ unique life and needs. 2012 was an important year for the Foundation. This was when we began researching on ways to help address water supply problems. After looking for solutions, we organized a well clean-up project. We installed solar panels to draw water from the wells and thus make irrigation possible. Atigh, the president of the Foundation, gave a talk at the Mauritanides, a large conference bringing together the mining and oil sectors of Mauritania. He highlighted local development and described how best to communicate with local populations. For example, installing a sign to mark a dangerous body of water is not effective. The sign ought to be replaced with an alarm system operating in Hassaniya, the local Arabic dialect. The same year, a large gathering was held in Tenoubak, whose goal was to reconnect local non-nomads with nomadic life. The La Khaïma Foundation helps bridge the gap between producer and consumer by purchasing locally made traditional handbags and ingredients, such as the vibrant hibiscus flowers for Atigh’s Hibiscus beverages. These products are made in the Ividjaren region of Mauritania and have been sold in Canada for years. In valuing these traditional textiles, the women in the community are empowered and recognized as preservers of old production techniques and designs that would have otherwise been gradually lost. Thus, old motifs remain alive and we hope, thriving. For the new generation of artisans, learning these skills allows them to stay connected with previous generations. These communities are proud to sell their products at the other end of the world, in Canada. Another very important factor for the community is that making these handbags enables the preservation of old production techniques which, without would otherwise have been gradually lost. Thus, old motifs remain alive. For the new generation of artisans, learning these skills allows them to stay connected with previous generations. These communities are proud to sell their products at the other end of the world, in Canada. Another product which permits its producers to be paid fairly is Atigh’s, the famous organic hibiscus juice, distributed in over 200 locations in Quebec. Hibiscus flowers are the jewels of the desert. 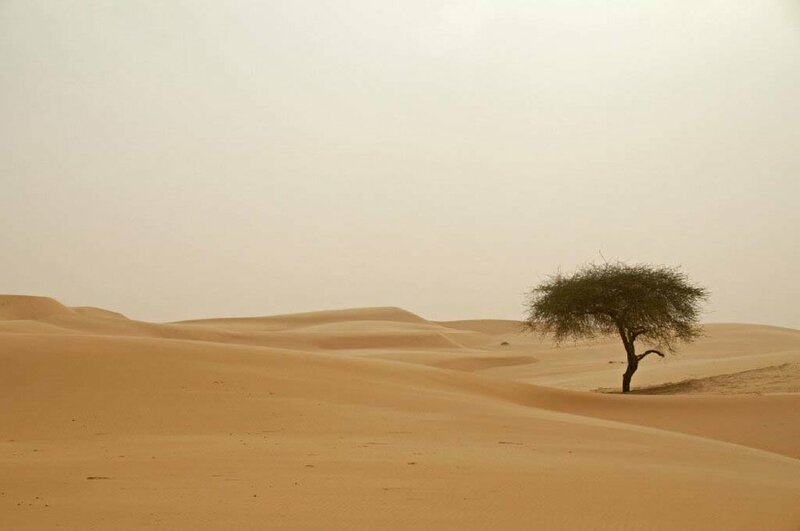 The extreme conditions of the Sahara strengthen their revitalizing properties. Nomads have been cultivating them for centuries, preparing them according to an ancestral recipe, which permits one to preserve their natural essence. In this way, they obtain a drink that is a brilliant red colour and offers an exceptional freshness. By purchasing this local ingredient the money earned allows the cultivators to make a good income and develop their communities. Proudly launched in 2009 in both Quebec and Mauritania by the La Khaïma Restaurant in Montreal, the La Khaïma Foundation is committed to community development in Mauritania. La Khaïma also encompasses the Nomad Festival in Montreal and Mauritania, and the production and sale of Atigh’s Organic Hibiscus. The La Khaïma Foundation, the Nomad Festival, the La Khaïma Restaurant, and Atigh’s Organic Hibiscus are all directed by Atigh. THE LA KHAÏMA FOUNDATION FAVOURS SMALL PROJECTS WHICH CAN LEAD TO GREAT CHANGE. From the beginning, human beings have been nomadic despite all borders, real or symbolic. Even if, over the course of centuries, we’ve become sedentary, a nomadic way of life still survives today. In the 21st century, when everything seems be continuously moving faster, when walls are being built ever higher and when people dig ever deeper into the earth, nomadic peoples are fighting to preserve their ancestral way of life, their know-how, and their traditions. They are the memory of humankind. We inhabit the same planet and this is our common concern. Changes that we create here have an impact elsewhere. In the same manner, whatever happens there has an effect here. We should think more about slowing down the pace of our lives and transforming our behaviour. We have much to learn from those who have been able to preserve a simple way of life in accordance with nature. The Nomad Festival aims to encourage the discovery of this richness which is, unfortunately, disappearing. The inspiring message of the nomads ought to strengthen our thoughts and our imagination in order to enable us to imagine, together, a mode of sustainable development adapted to their way of life. WHICHEVER THE CONTINENT, NOMADIC PEOPLES ARE FACING SIMILAR ISSUES. They want to be recognized for their socio-economic contributions (stock-herding, food security, craftsmanship, local medicinal knowledge, etc.). They want people to hear that they have a right to live in a different way, to be recognized for their know-how, and to equip themselves with tools to withstand the negative impacts of globalization. Whether you are a nomad who walks with his or her feet or someone who traverses distances in their mind, whether you are a traveller, or are just curious and motivated, join us!